25 February 2013 – I love a good Honeycomb!! Don’t we all, especially when it’s fat free!! I love the new Honeycomb embossing folder in the new Seasonal catalogue. 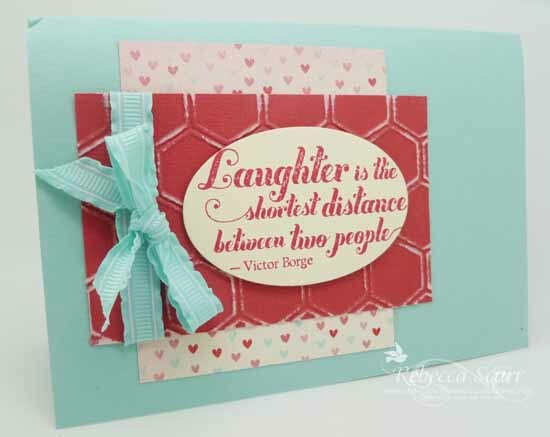 I have seen so many gorgeous cards made with it on my favourite website, Pinterest!!! My team, Eureka Stampers, has a monthly swap which generally has a theme. This month is the new catty. I enjoy using sketches to help design a card so this time I used the Mojo Monday 279 sketch. Check out the Mojo Monday blog here. So, this is the sketch. I wanted to used the new Core’dinations card stock as I haven’t opened the packet yet. I’ve also used the gorgeous More Amore Specialty DSP which is just lovely. I hope you like it! Accessories: Big Shot, Stampin’ Sanding Block, Pool Party ruffled ribbon, Honeycomb embossing folder, Ovals Collection framelits. « 11 February 2013 – I’m on the banner wagon!